I would like to ask someone who's got experience with this one. I ripped off the tiles in the room upstairs (20% cracked during a decade) , they were on some sort of cement-wood boards. The boards screwed to the steal. The floor looks pretty level as I prepared it with an angle grinder and filled some small dents with cement. So is it possible to lay a foam on this and install those vynil click planks (no glue) on this surface? Sounds ok to me, you mean using the 5mm silver backed ethafoam as a base. Typical floor planks clik lok are hdf with a vinyl or real wood veneer so just be aware you need to leave a 10mm gap around all edges to allow for any expansion. From what I have read.... the subfloor needs to be really well prepared... i note from your op that you’ve worked the floor already, but this does need to be very flat to avoid small distortions that might make your floating floor joints lift... there are several diy videos on this subject on utube that might help.... good luck. To be on the safe side and providing the sub-floor is wood, you could ply board it using 6mm thick ply. It doesn't cost too much and you can cut 6mm ply with a sharp flooring knife and use ring shank nails with spacing about 6 inches apart. If I put a ply board on it would be too high compared to the floor outside the room. I prepared the floor flat enough as I checked with a spirit level. 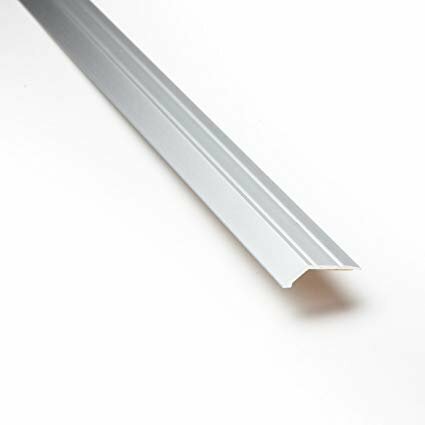 If you're separating rooms with threshold strips then a self-adhesive ramp edge strip will do nicely with i slightly raised floor. The usually come in 3' and 9' lengths. Any idea where to buy threshold strip? Global house didn't have it. Look again, Global has an extensive range of threshold trims, but there should be matching ones for the clik floor. Also look in the tiling area, many floor trim of all shapes and sizes. Even tesco carries door threshold strips, but limited to brown or white. Room is looking good now, thanks for the advices. I used the 6mm plywood, then foam and vinyl plank. Space for expansion, baseboard not siliconed and T-mold transition. Now I have one more room to go. I have some left over exterior paint which I like the color of it, is it possible to use it in the room? I﻿ have some left over exterior paint which I like the color of it, is it possible to use it in the room? No problem, it is a problem if you use interior paint outside.